The Unitarian Universalist Urban Ministry, located in the heart of Roxbury, offers a unique opportunity for suburban congregations to connect to Roxbury. We are separated from this and other urban neighborhoods by race, class, and geography. Media reports and fear of the unknown strengthen that separation. 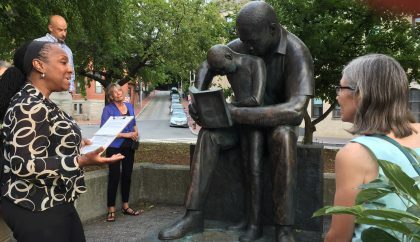 Follen Community Church’s Urban Ministry Congregational Team is offering Roxbury Connections, a yearlong program to foster connections with Roxbury and to support the UU Urban Ministry. Roxbury has many challenges created by racism and the legacy of slavery. However, the manner in which Roxbury is often presented as only about those challenges is also a form of racism. Roxbury has assets and strengths that we don’t hear about. Roxbury has a wealth of culture—art, theater, concerts, historic houses, a museum dedicated to Black Art worldwide, stunning architecture, restaurants—that are often unknown to many in the suburbs. Roxbury has a rich history, starting with Native Americans who traveled through Roxbury up to the Civil Rights struggles of the 1960s and beyond. Roxbury has many activist organizations working every day to bring justice to Roxbury and the country. Roxbury Connections gives us an opportunity build bridges in a way that celebrates Roxbury’s strengths. Roxbury Connections supports the work of the UU Urban Ministry by strengthening partnerships in the Roxbury community. Showing up for events demonstrates our commitment to Roxbury and often speaks louder than words. Roxbury Connections helps dismantle our cultural racism and expand our cultural intake. Roxbury suffers from racism and the legacy of slavery—mass incarceration, poor education, high rates of unemployment, single-parent families, and more. We want to change that and bring justice to Roxbury. Roxbury Connections will give us the opportunity to be stronger allies in this struggle. A moderated panel discussion with three Muslim Americans. The public is invited. If you have questions, please email uuum@follen.org. We hope you will join us!